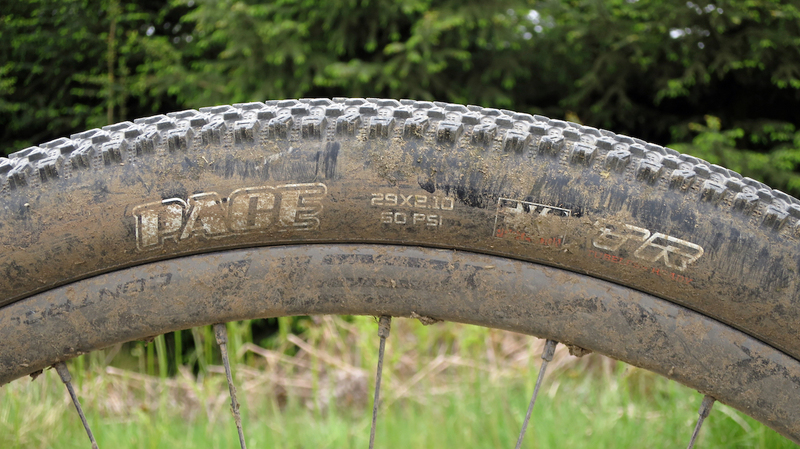 Maxxis’ Race TT and Pace buck the current trend of ever wider and grippier tyres. 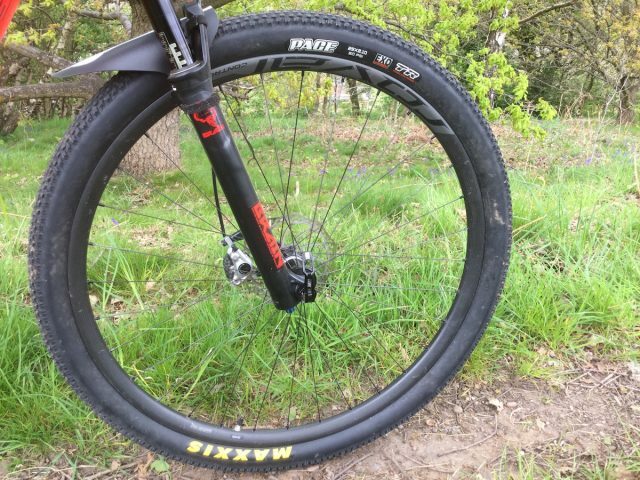 As their names suggest, these are fast tyres designed for speedy cross-country riding and are suitably slick and narrow. 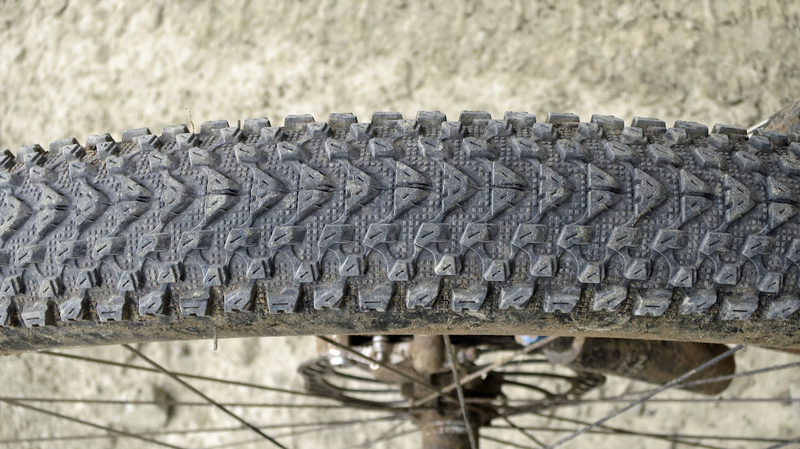 The fast-rolling Maxxis Pace tyre is based on the popular Ikon tread pattern. “Pick up the Pace! The Pace was designed to meet the needs of our World Cup XC racers. A high-volume, low-profile tread design offers minimal rolling resistance and consistent traction across the profile of the tire. Continuous side knobs keep you planted where traction is critical, and the single compound balances traction and tread wear” – From Maxxis. Shallow micro-knobs are spaced tightly together for speedy rolling on hardpack surfaces. The Pace is the equivalent of a low-profile Ikon. I’m a big fan of the Ikon on the rear of my XC bike so I was looking forward to giving its faster little brother a go. On the rear the Pace performs brilliantly on dry, hard packed trails and is very, very fast. It rides with virtually no perceptible drag on fire roads and tarmac and it really suits high mileage missions of the low-tech variety. 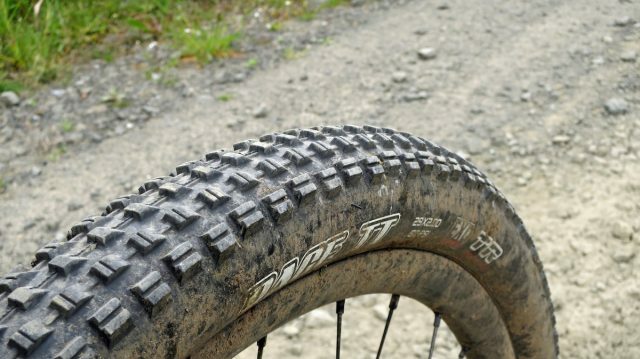 These are best thought of as dry-condition only race tyres. Unsurprisingly with its low profile and narrow width (I had the 29er 2.10” version), it isn’t so great on wet rocks or in the mud where grip is virtually absent. Even with my best efforts, I found it really hard to maintain traction whilst climbing when it wasn’t completely dry. I encountered lots of wheel spin as soon as the conditions were mildly damp or loose. Up front on mixed conditions, the Pace tyres show their weaknesses pretty quickly. On the front the Pace is best described as “death or glory”. If you value speed over grip then the Pace will reward your segment-hunting behaviour but it’s definitely not going to get you out of jail if you hit anything but the perfect line in those optimally-dry conditions. In terms of grip, it’s quite similar to the Bontrager XR1 tyres I’ve been using lately, though the Pace does have the edge when it comes to cornering grip. That said, I’d personally stick to running the Pace on the rear. 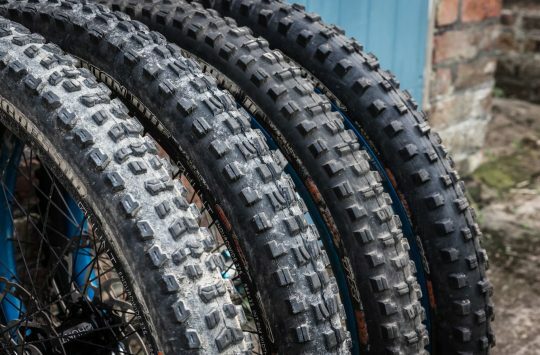 A rebirth of the venerable Larsen TT, the Race TT tyre brings EXO sidewall protection and tubeless ready performance to the fast-rolling tread pattern. 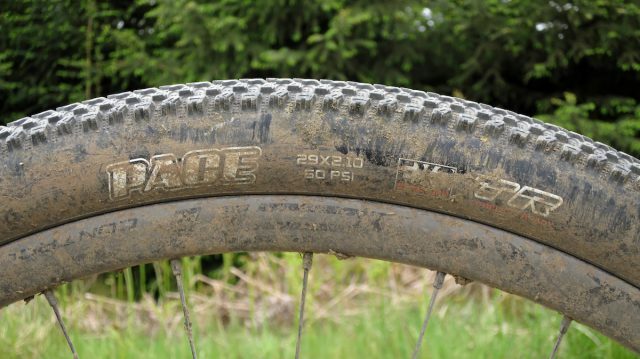 “The Race TT has a familiar tread pattern refi ned for modern XC bikes and race courses. Tightly packed and ramped square knobs allow this tire to roll freely, while updated siping increases the Race TT’s braking and cornering limits. 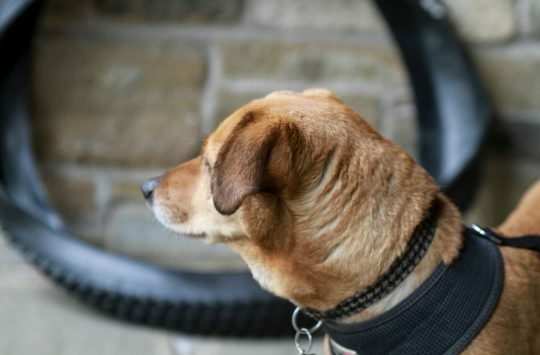 The legend lives on with the Race TT” – From Maxxis. 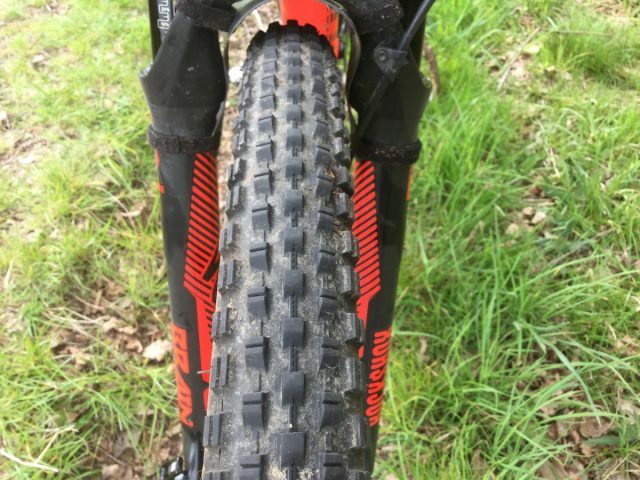 Tread depth is slightly taller on the Race TT tyre, and with extra siping, those tread blocks cling well to dusty and rocky trails. The Race TT is the modern-day equivalent of the iconic Larson TT (there’s a blast from the past!). It has a narrow aggressive tread with a ramped leading edge. It’s fast rolling in a straight line and – compared to the Pace – the blocks provide decent bite in firm and slightly soft conditions. But whilst giving great grip in a straight line and on braking, I found it didn’t perform as well on turns. Ramped centre treads reduce rolling resistance. 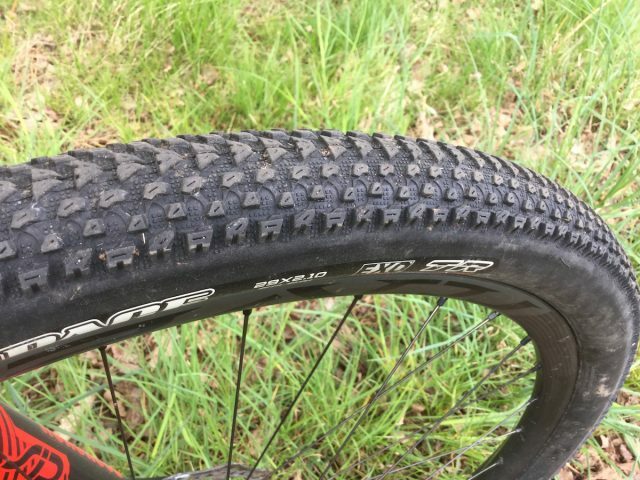 The tread is pretty square-shouldered, which combined with the narrow 2.0in width, gave a squirmy, noodley feel on cornering hard when the tyre reached its limits. On first looks I assumed that the aggressive tread would mean that the Race would perform well in muddier conditions. But although the blocks gripped well, they were too tightly spaced to effectively shed the mud which meant it didn’t perform as well as I’d hoped. For a racing setup on dry and dusty trails, the Race TT up front and the Pace out back is a great combination. 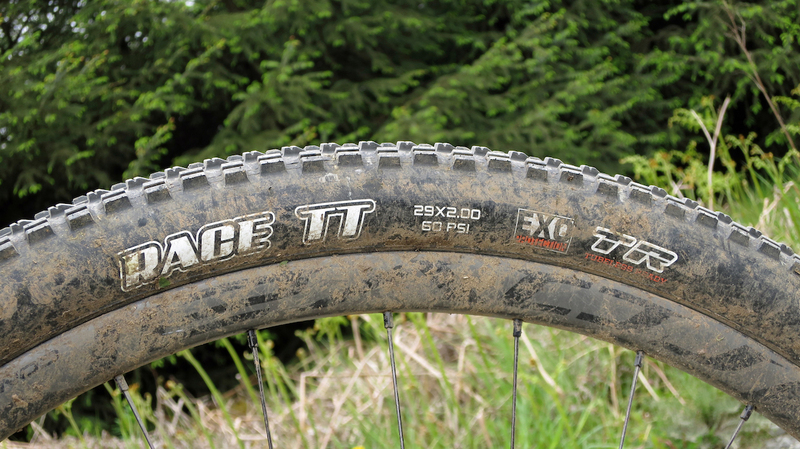 For XC race-orientated tyres, both the Pace and Race TT have been solid and predictable performers. And with the EXO reinforcement, they’ve remained stable at lower pressures and so far (touch wood…) haven’t delivered me any sliced sidewalls. 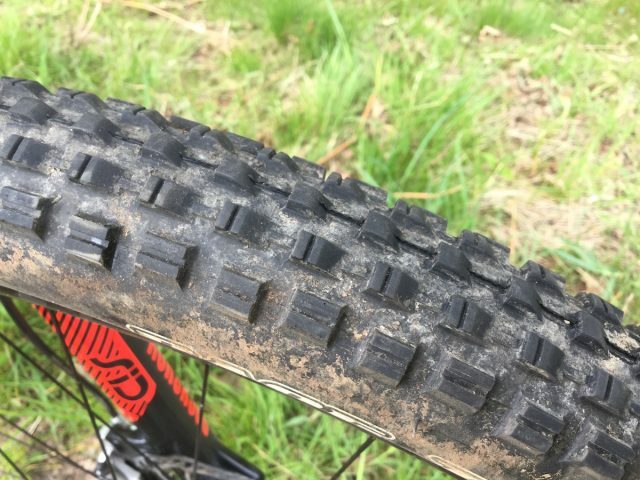 The tread and sidewalls are also showing little sign of wear despite some high mileage and ham-fisted use over the test period, which is a nice change from some of the more delicate race tyres on the market. As for their on-trail performance, they are both dry-condition specific tyres, so don’t expect these to be an all-year round option. For a race-day tyre tackling hardpack and dry conditions, they are superbly fast tools for the job.